My eldest son loves to build and construct so I imagine that he will become an architect, my daughter plays doctors and my youngest son loves animals so he may become the veterinarian in the family. Do you ever imagine your child’s career path? Baby Potential has launched a line of career inspired apparel for your baby or toddler that it instills confidence early in life by using inspiring role models such as “Artist”, “Biologist”, “Philanthropist”, “Teacher”, “Radiologist” and more. I fell in love with the “Veterinarian” T-Shirt for toddlers because my youngest son has an extraordinary love and compassion for animals. The Baby Potential apparel line is made of 100% cotton, features a quality screened patch that stands up to repeated washings and has a double stitch needle detail and a form fitting shoulder for a great fit. I was impressed with the Baby Potential t-shirt when it arrived because it obviously does not skimp on quality. In addition to their standard line on onesies and T-shirts, customers can also select a customized onesie or T-shirt that has the most delicate hand crafted embroidery around the neck line and a personalized career title. 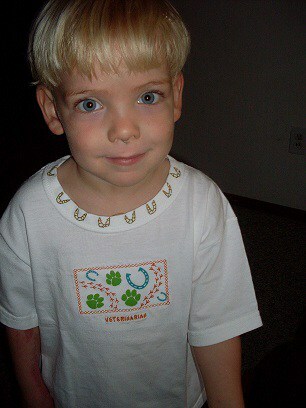 You can see the beautiful workmanship of the embroidery on the neck of my son’s “Veterinarian” T-Shirt. The custom onesies and t-shirts are created by a “Sew Circle” of women in San Antonio who, in partnership with Family Services Association , are provided an opportunity to earn additional income while working at home. I like that this line was inspired to instill confidence at a young age in all children and to show that any child can grow up and follow their dream or career path. Baby Potential products can be purchased at Target.com, select retailers and online. A custom Baby Potential onesie or T-shirt would make an excellent shower gift for a mom-to-be. Sets retail for approximately $15 and up. I love their products too. They have such great designs.